Do you intend to get a new Echo Show device for your home or have you already gotten one? Are you looking for simple ways to set up and customize your device? Have you bought other user guides on how to manage the device but became confused due to the fluffy, jargon-filled information compiled therein? Do you wish to add more spices and flavors to your smart home? Do you have any other Amazon Echo devices (Tap, Dot, Plus, Look, etc.)? If you answered "Yes" to any of these questions, then congratulations! This user manual is definitely for you. The Amazon Echo Show Manual has been designed with specific step-by-step instructions that are easy to understand. It contains basic information with amazing tricks and tips that will enable you become a pro within 60 minutes. Make and receive calls; send and read voice messages. Customize and manage your media collections. Get information about the latest customized traffic, weather, and news updates. Manage your shopping/to-do-lists, calendar, etc. Use simple Easter eggs and pretested commands. Vol 2? Where does the time go? 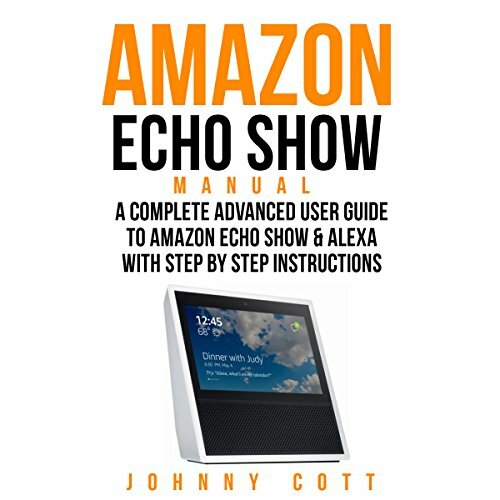 JOhnny Cot has crafted a second book detailing the proper way to employ and use the Amazon Echo Show in conjunction with Alexa. This is a detailed piece of information that is extremely useful to anyone new to the AES, or has issues with syncing their Alexa to anything. Personally, I have two Alexa's and getting her to understand anything is nearly impossible sometimes. The book is highly detailed, is very helpful, and easy to understand. If you are having any issues getting this device to do what you want then this is the book you will want to turn to. CLinger narrates in easy to understand words, and you will have absolutely no issue following along with what he says. Even though I did receive a promo code for this review it in no way influenced my considerations of the material, and in fact, inspired me to be more honest. Getting a code generally makes me harsher as a reviewer as I am more often concerned what someone like Me will decide based on my review. This book is narrated by a computer, not a human--very disappointing. My goal was to have the book read to me while I set up my Show. It didn't work. I was able to gain some insight, but wound up getting the Kindle servion to read while I set up the device.